The Scout RX1, incorporates a systematic navigation system. This means that it covers the area to be cleaned in parallel tracks. Its systematic navigation system achieves more reliable coverage and saves time and battery power to boot. Furthermore, complex floor plans involving several rooms can be vacuumed in their entirety, including return trips to the base on completion of the task and for recharging. Miele's Smart Navigation relies in the first instance on a so-called gyro sensor which measures rotation and changes in direction. The Scout RX1 has a high-quality digital camera on board which scans the ceiling of the room several times a minute to ensure additional precision. 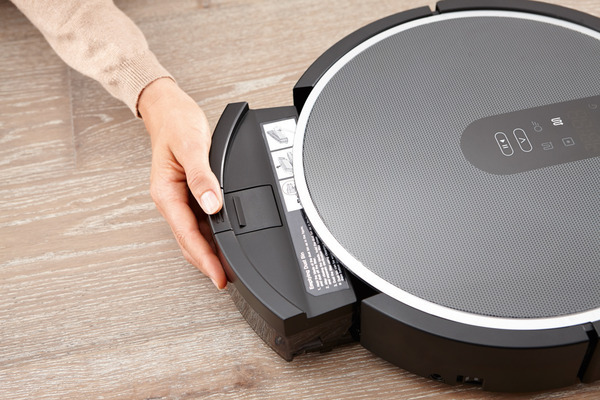 This Miele robovac has seven infra-red sensors on the front of the unit. These scan a 180° area ahead of the machine in order to avoid collisions with furniture and other obstacles. Three further sensors below the unit prevent the Scout RX1 from falling down stairs. Two long rotating side brushes target difficult areas along the walls of rooms or along items of furniture and sweep dirt towards the centre of the unit. Once there, a removable beater bar picks up coarser particles. In the third stage, a fan transports the finer dust into the dust box. This container has a capacity of 0.6 l and can be removed at the touch of the button. An AirClean filter ensures clean room air. In 'Auto' mode, the unit travels through all rooms. 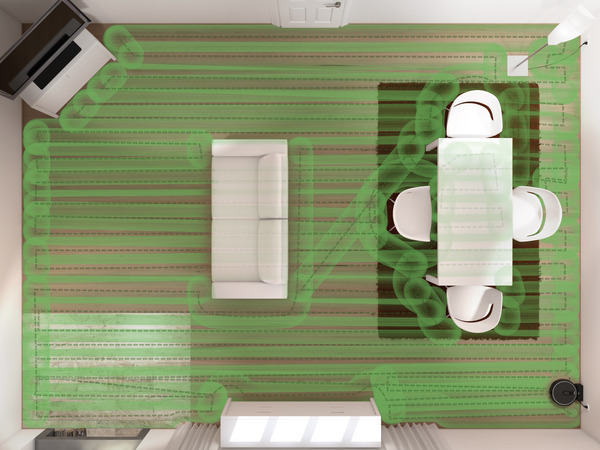 'Spot' mode is intended for a defined area of at most 1.80 metres square, for example to clean up crumbs from under the breakfast table. In 'Corner' mode, all rooms are first cleaned in 'Auto' before returning to clean all edge areas once again. 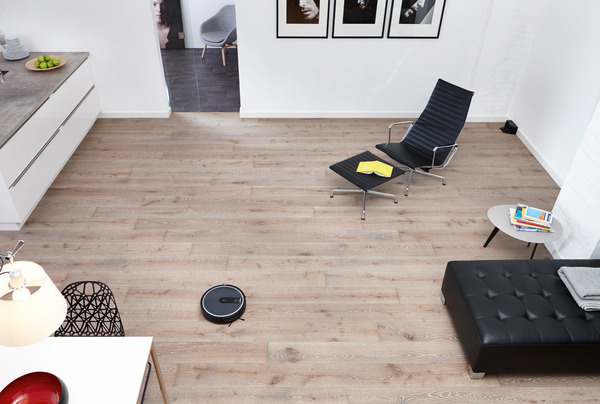 For particularly fast cleaning, Miele offers its Turbo mode in which the robovac cleans the entire home but travels in straight lines with greater spacing. In this case, cleaning is somewhat more thorough than in 'Auto' mode but only takes half as long. 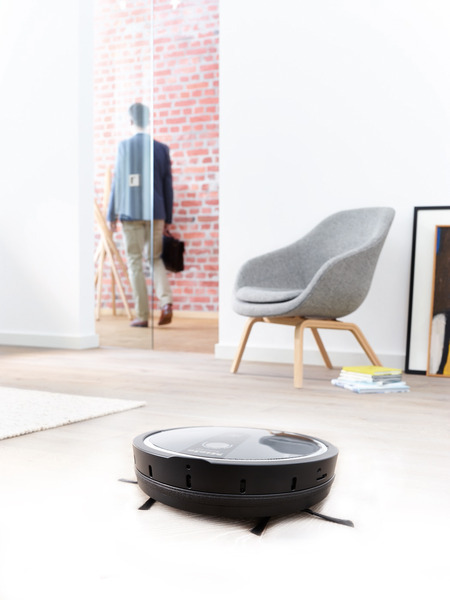 Overall, a battery charge is able to clean an area of up to 150 m², corresponding to a duration of approx. 120 minutes. 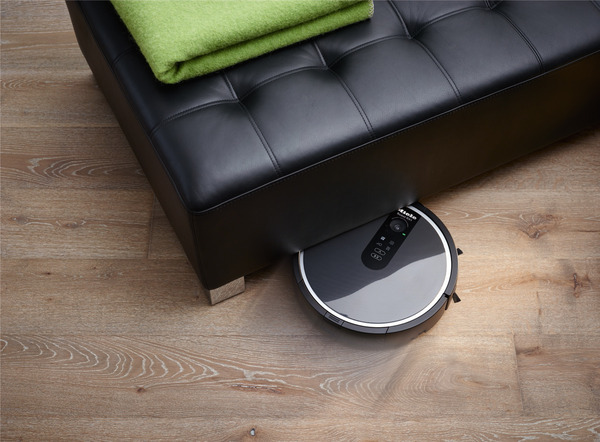 When cleaning larger areas, the unit pauses as and when needed to return to its base for recharging. Work is automatically resumed after approx. 2 hours at the precise point where cleaning was interrupted earlier. Even after 300 recharging cycles, the battery still has the capacity it had when new. 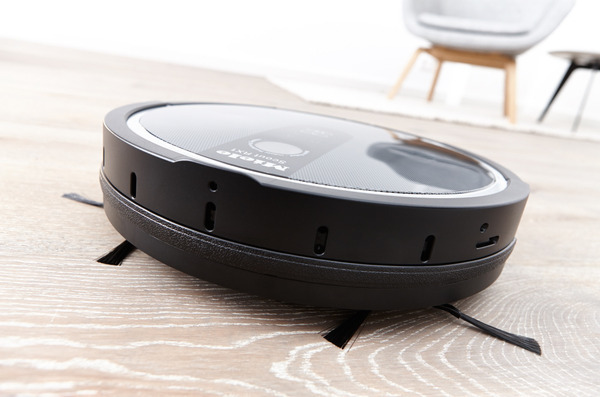 With this combination of battery charge and battery life expectancy, Miele currently represents the benchmark on the robovac market. 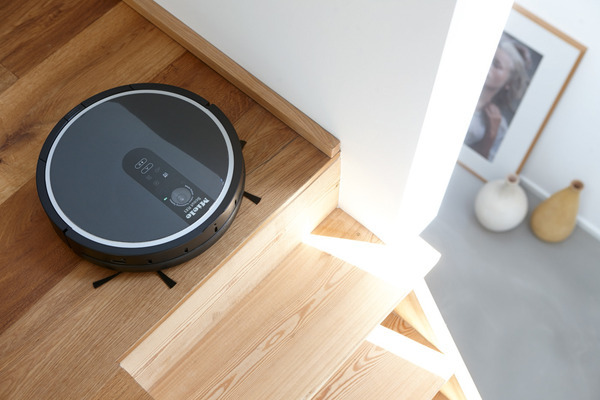 The Scout RX1 has good traction on all common floor coverings and is even able to negotiate height differences of up to 2 cm, for example thresholds and the edges of rugs. Rooms or areas which are to be excluded from cleaning can be cordoned off with a magnetic strip. The Scout RX1 is started either at the controls on the unit itself, using the remote control handset or by programming the timer to start and finish at pre-defined times. 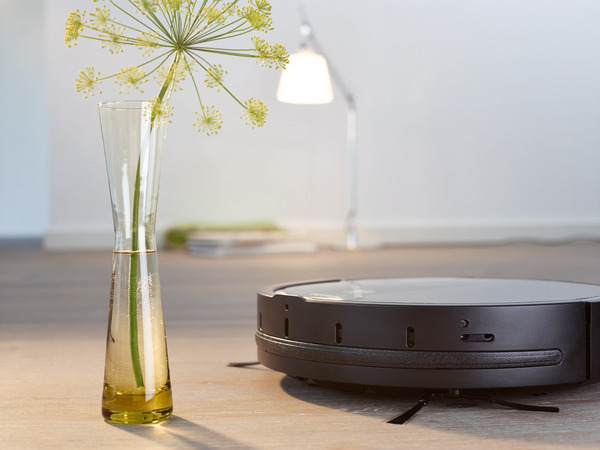 The design of the Miele robovac is both high-quality and elegant. This is achieved for instance by the white characters on a black background in the display which are not only easily legible but also blend in perfectly with the Miele product family design. A rear-printed plastic insert on the top of the machine further underlines the noble overall impression. 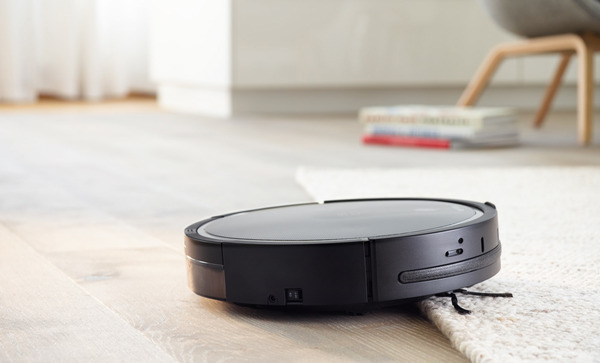 Miele’s robovac Scout RX1 is a practical second appliance for automatic cleaning in between times. 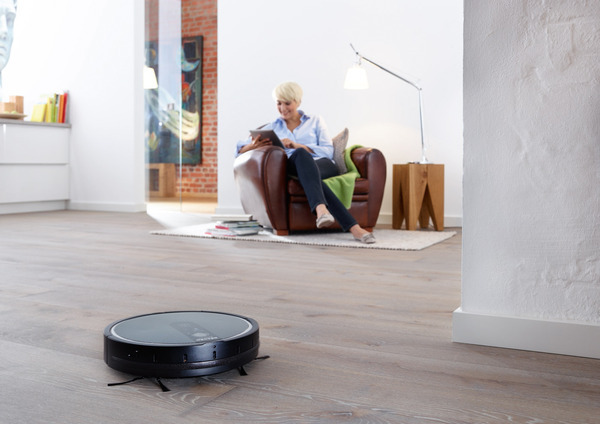 Miele's Smart Navigation relies in the first instance on a so-called gyro sensor which measures rotation and changes in direction. This alone would be sufficient to systematically clean a room. Besides this, though, the Scout RX1 has a high-quality digital camera on board which scans the ceiling of the room several times a minute to ensure additional precision. The interplay of gyro sensor and ceiling-scanning camera ensures that the perimeters of rooms and difficult-to-access areas are cleaned without gaps. The Scout RX1 incorporates a systematic navigation system. This means that it covers the area to be cleaned in parallel tracks instead of randomly criss-crossing the room, the more common approach adopted by the majority of models which use chaotic navigation. Seven infra-red sensors monitor an angle of 180° ahead of the unit and therefore prevent collisions with furniture and other objects. In contrast to most other common systems on the market, these sensors stop the vacuum cleaner in good time before a collision occurs. 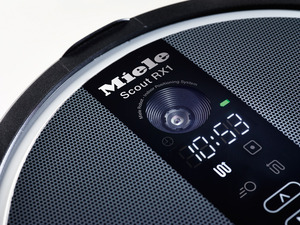 Miele’s Scout RX1 meticulously wends its way through the room track after track, covering edges and other inaccessible areas without gaps. 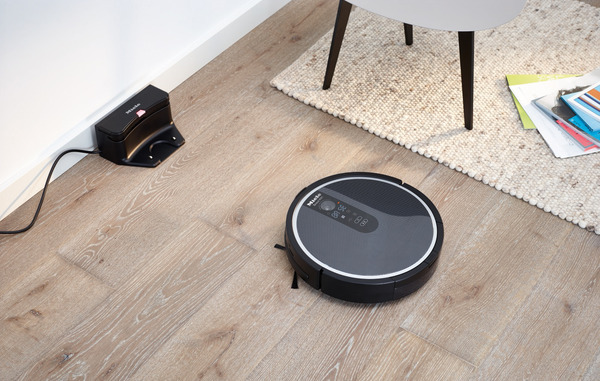 The Scout RX1 has good traction on all common floor coverings and is even able to negotiate height differences of up to 2 cm, for example thresholds and the edges of rugs. Return trips to the base on completion of the task and for recharging. 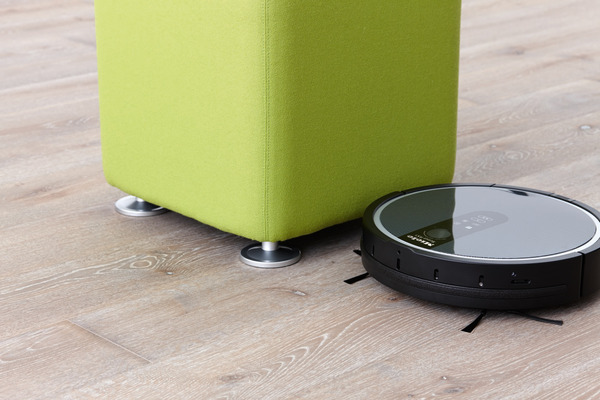 Particularly effective cleaning is guaranteed by the Triple Cleaning System: Two long rotating side brushes target difficult areas along the walls of rooms or along items of furniture and sweep dirt towards the center of the unit. Once there, a removable beater bar picks up coarser particles. In the third stage, a fan transports the finer dust into the dust box. This container has a capacity of 0.6 l and can be removed at the touch of the button.